I am pretty sure that Dylan boasts a better wardrobe than me, and he is turning into quite a trendy little toddler. Mamas and Papas have recently sent us an outfit each for both Dylan and Archie and we have been busy testing their new togs. 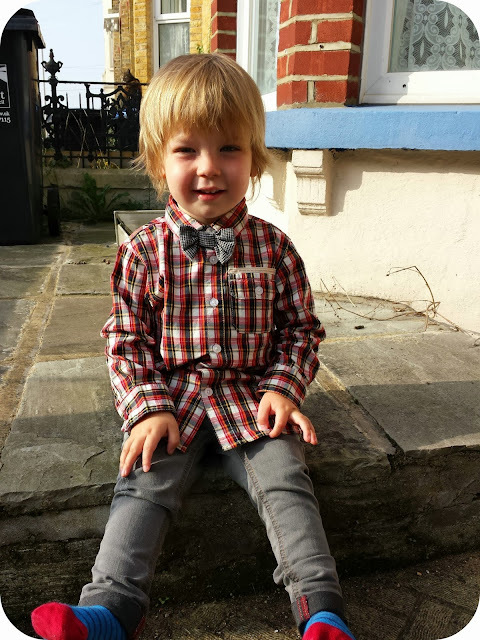 Dylan was sent a shirt, bow tie and skinny jeans (which are now in the sale). The shirt and bow tie are not something I would usually choose for him, but the jeans I just love. 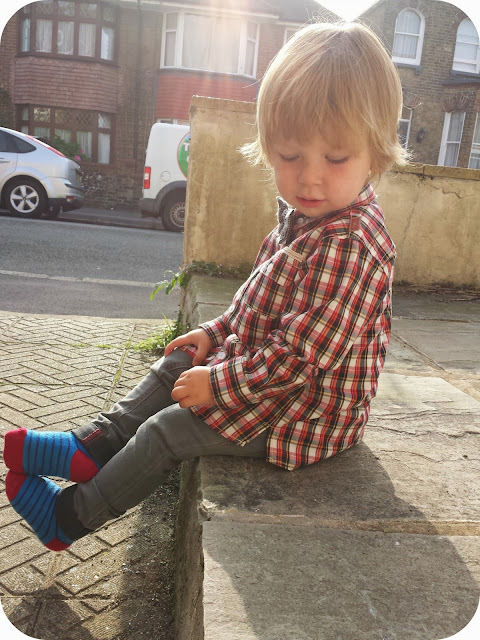 The shirt is well made and the material is lovely, but I will be teaming it with an open neck, rolled up sleeves and a white T-shirt for the little man as it seems more practical for everyday wear. It is perfect for smart occasions though with the funky bow tie and I know it will get worn as it is meant for parties and special occasions. 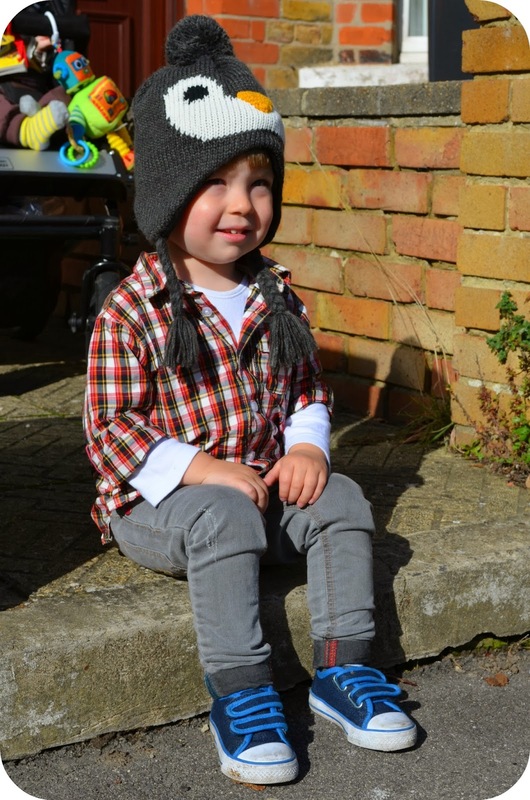 The jeans are wonderfully soft and stretchy and perfect for an active toddler. I love the material and Dylan has been getting a lot of use out of these. I will definitely be looking in Mamas and Papas for his jeans in future as the stretchy waistband and cut means they are a great fit. I love Archie is sleepsuits and I think with the colder weather he can get away with them still as day wear for those lazy days. This velour sleepsuit looks very neat from the front as the poppers are all on the back. This is really comfy for Archie as he tends to play either sitting up or lying on his tummy and sleeps on his tummy too. I love the contrast on the bottom of the feet and the orange stripes look really funky. This is not something I would have probably chosen off the shelf but it is lovely and cosy and Archie has been wearing it lots. I can see it will be perfect over the winter and easy to put a snowsuit over the top of whilst keeping Archie as comfy as possible. We have used it at night and it is thicker than our other sleepsuits, but I think it is too nice to be kept hidden away so it is mainly used as daywear. 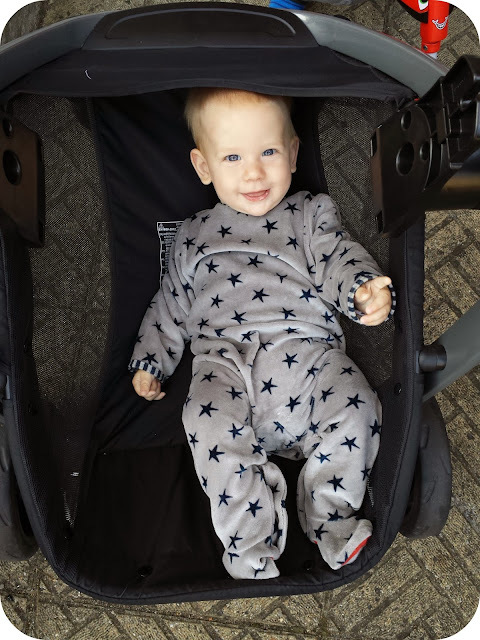 The quality of the Mamas and Papas clothes is amazing, they feel durable, comfortable and soft, and I think both outfits look great. CK has exactly the same jeans. They're so cool. I like Mamas and Papas but find their clothes sized slightly small. Good quality though.